OK, here we go - this time, Cameron, you cannot hide behind vagueness and prettiness. Do you agree or not? Should we cut taxes or not? Straight answer, please. Or let me put it to you in the honest formulation of your behind-the-scenes guru, the great Oliver Letwin, who declared earlier this month that the Conservative Party should never again go into an election promising tax cuts. Who do you agree with, Mr Cameron: Letwin or Davis? It cannot be both. And your nice evasion, “we'll share the fruits of economic growth between tax reduction and public services” - that won’t do either. Those of us who believe in lower taxes do so not out of greed but in a belief that it leads to economic growth. Let me, for clarity, repeat: that tax cuts create economic growth, NOT that tax cuts are a luxury after economic growth has occurred. It’s the difference between a plan and a hope. Hopes are not enough. Blair would sign up to that hope. So would Brown. Even Skinner wouldn’t be too troubled joining with that little subterfuge. The issue is not what to do with all the extra money, one day when it miraculously flows in: it’s whether you believe in the greater dynamism of a low-tax economy, or not. And if you do believe in it, it means you cut taxes in order to achieve it, not as a consequence. You do it, you don’t just fantasize about it. It’s simple. But your “sharing of the fruits” vision shows a fundamental inability to grasp the argument (or an unwillingness to). I truly admire Letwin, though I think he’s wrong on tax. But he’s done us a great favour in putting the moderniser case so clearly. Will you do the same? If you run away from the challenge, or hide from it behind sweet phrases, you will be seen as a Blair-imitating coward, at the very time when this country doesn’t need Blair-imitating cowards. But if you dare to agree or disagree, straightforwardly, without an Osborne-style ‘commission’, then we can all have respect for you.e of them urging you to continue in the same way that has so far worked brilliantly for you, avoiding the difficult choices so that everyone thinks you’re a friend; the other win telling you to ‘diss the right’ so that when you win, you have a proper ‘mandate for change’. The radicals in your camp fear that if you are not clear about your plans now, before the vote, then you might end up like John Major, having won on a false prospectus and thereby making radical modernisation too difficult. So now we come to a testing moment for you, Mr Cameron. A fundamental, necessary choice. This is your turn to step up to the plate, or flunk it. I know, Mr Cameron, that you are being asked to choose between two wings of your campaign team right now - one of them urging you to continue in the same way that has so far worked brilliantly for you, avoiding the difficult choices so that everyone thinks you’re a friend; the other win telling you to ‘diss the right’ so that when you win, you have a proper ‘mandate for change’. The radicals in your camp fear that if you are not clear about your plans now, before the vote, then you might end up like John Major, having won on a false prospectus and thereby making radical modernisation too difficult. So now we come to a testing moment for you, Mr Cameron. A fundamental, necessary choice. This is your turn to step up to the plate, or flunk it. I'm surprised. This post has been up a while now and we've yet to be crushed in the stampede of the 'axis' rushing to squawk about Davis 'smearing' Cameron for being policy-lite or being a repetition of Tony Blair. It is nice to see one of the candidates offering a clear, specific policy on one of the issues that matter most instead of hazy, vague posturing. If Davis is offering cuts upto £1200 for the average family... The public will jump to one conclusion, cutting public services such as the NHS and Education. This is not the image the conservative party should be selling to the public. Labour will rip through this policy quite easily if faced in a general election... This is not the US of A... The USA is a very conservative nation as a whole, the UK fancies more European socialist policies. 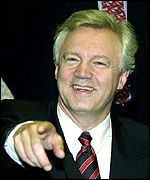 David Davis... the true conservative, the modern briton? Nah. I agree, Jaz, it will be difficult to sell (to the wider public) if the election was one month away (as it is for us) but if elected leader (unlikely as it seems) he'll have three years to sell the policy to the public. That's not an impossible task. As Lord Tebbit observed after the last election, it takes time to make the moral and practical arguments for tax cuts. Michael Howard didn't have that luxury (a cruel man would say he also had a barely credible Shadow Chancellor). Our next leader shouldn't have that problem. Even something like the James review can be explained and sold with time (IMO its weakness was that it lacked detail - powerpoint slides do not make things look thoght through). Kudos to Davis for making this move. I look forward to seeing the detail tomorrow (especially with regards to the first year). The public will ask HOW he will do it and at what cost.. DD being incapable of being an inspiration and convincing to his own party, I don't see how he will inspire the nation to adopt this. Cameron talks about a decent and workable policy...yet there is so little detail to what he actually means...That I am tempted by DD. Cameron does hint that there wouldn't be tax cuts on income, but rather tax relief in certain areas (hopefully pro-business). Its an interesting world, Cameron isn't talking enough about tax, DD has overdone it to a point that it might be unsellable. "This is not the US of A... The USA is a very conservative nation as a whole..."
The USA can't be so easily generalized about. "A Davis-led Tory government would introduce a 'growth rule' which would limit spending increases to below the trend rate of economic growth." This is similar to the trend of a so-called Taxpayer Bill of Rights, or TABOR for short, first adopted in Colorado in 1992. Colorado is certainly to the right of the UK, but "very conservative" would probably be a stretch: while Colorado Springs is a bastion of the religious right, places like Denver and Boulder are solidly Democratic and, of course, the ski resorts like Aspen and Vail are full of wealthy vacationing lefties. The rest of the state is, like much of the Rocky Mountain West, moderately conservative with a libertarian bent. Now, TABOR was an amendment to Colorado's state constitution, so there's no really analogous way for a future Davis government to entrench it, but as a policy, I don't see why capping growth in public spending to below the combination of population growth and inflation would be such a hard sell. Surely most voters realize by now that nearly a decade of Gordon Brown throwing money at problems has not improved things and, if anything, generally made circumstances worse. "It's too difficult to sell" - so what exactly are you in politics for? To achieve something? Or so that a few activists get nice jobs in politics? To change this country for the better? Or to hang around the musty "corridors of power" yapping like a lap-dog after after the 'insights of focus groups'? Who cares if the Conservatives get 'in power' if they have to copy Blair to do it? If you won't do what you know is right because it's "difficult to sell" then you are worthless as a leader. Davis is right. Well I would say that, wouldn't I. Although that doesn't stop it being true. "There is also backing, by 46% to 28%, for a policy of cutting taxes and public spending. Similarly, and by 50% to 28%, voters think the Tories should propose radical reforms for the National Health Service and state education, including privatisation. And this is even before Gordo's next tax bombshell due to explode shortly. b) The lesson of the last election is that voters didn't believe we actually would cut taxes. Like someone said, you can't fatten that pig on market day. This is an excellent policy announcement, and I commend it to the Blogosphere. "The US budget deficit, by the way, reflects a failure to control spending]." If President George Bush cannot control Defence Spending who can ? Buying warships at $750 million a pop is stupid as is the enormous waste on new welfare programs for Lockheed Martin, Boeing, Grumman, General Dynamics. Bush not only cut taxes but increased spending.........if some of the ideologues on this thread would start to look at facts rather than spout opinions we might get a more sensible and rational discussion. David Davis is clearly clueless if he thinks tax cuts are a good idea when the Government is borrowing so heavily at present and tax increases are forecast. Davis just gave an assured performance on the Today Programme. If ever politicians start having fire-side chats he certainly has the right whatsit. The economic commentator on previously had said that although these weren't "cuts", per se, they will still feel like cuts because public sector inflation is higher than private. To which David was able to appear entirely in command of the facts by saying - among other things - that public sector inflation is in a large part driven by spending. He also repeated twice the dreadful statistic that the public sector is a higher proportion of our GDP than at any time since 1979. And then we had an economic disaster, followed by real spending cuts. He was entirely in command of the interview. Rick...not quite sure that I follow your point. Yes, politicos are v bad at controlling spending. But that's why we need a spending rule- think of it as an extension to Gordo's Golden Rules (and yes, we do need an independent Budget Office to keep the score). Where politicians and money mix, we always need RULES not DISCRETION. You may describe that as ideology: I describe it as common sense born of long and bitter experience under both parties. And as for Gordo's tax rises and borrowing binge...well, yes- another reason for having a spending rule. Doesn't sound "clueless" to me. ""There is also backing, by 46% to 28%, for a policy of cutting taxes and public spending." For the first time since about 1992 a leading Tory announces a major tax cut. And an income tax cut aimed at everyone, not some fancy cut aimed at a slither of the electorate. If adopted, it should be followed up with constant attacks on Labour's wasting of money that belongs to taxpayers and which taxpayers should be left to decide how they spend. The tax level at 42% of GDP is far too much, and way above those countries we naturally compare to - eg Ireland, Australia, NZ, USA etc. Re electoral popularity, tax cuts are popular, see 1959, 1970, 1979, 1983, 1992 elections - all one thing in common, Tory tax cuts (and material ones) = Tory victory. See also the Liberals win in Australia in 1998 and the Bush wins. "stole the frontrunner status from the uninspirational David Davis"
I think we would appreciate a BBC type impartiality from the Editor if this isn't going to descend into an American type biased website. Outside of the Conway and Mitchell households - and perhaps your own FG (!) - I'm not sure many people believed that DD's campaign has been anything other than 'uninspirational'. Anyway this post is clearly marked as an editorial. I don't believe this tax relief is possible. Its true that in the long term tax cuts stimulate consumer spending and investment BUT in the short term the Exchequer has to balance the books. Quite simply I don't believe that a Davis chancellor (presumably Willetts) would be able to manage Gordon Brown's debt (about £11bn) and cut taxes whilst still maintaining levels of spending on Health, Education and Defense. David Davis is allowing himself to become the sort of leader Labour has painted into a corner with very little effort. More of the same is still not good enough! "many commentators have suggested the Davis campaign has been uninspirational"
If William Hauge lost the 2001 election promising tax cuts of eight million why anyone thinks the result of the next election would be any better if the party promised £138 million is complettly beyond me. The biggest problem the party as in convincing people to vote for it is that people think we are more interested in cutting taxes than we are improving services. Frankly they just can`t bring thereselves to trust us with there public services. Members have a choice thankfully. They have David Cameron who recognises this and David Davis who doesn`t and who apprantly seems to think that the way back to power is by being even more right-wing than we have been these last eight years. God preserve us! "If William Hauge lost the 2001 election promising tax cuts of eight million why anyone thinks the result of the next election would be any better if the party promised £138 million is complettly beyond me." Jack, can you imagine *any* platform on which we would have won the 2001? Be honest. Jack you going down the deadend of trying to be Blair-lite thats not going to win us the next election. The thing WH and MH failed to do at the last two elections (perhaps because of a lack of time) was to connect tax relief with the economy and with moral objectives. If enough voters (over the next three years) (1) come to see tax relief as essential for wealth and jobs creation and (2) see it, for example, as a good way of securing higher work-rates amongst the poor, they might vote for it. At the moment tax relief is not a winning issue because it is seen as necessitating spending cuts. So long as the issue is framed in the existing way tax relief can never be sold electorally. You may argue that those projections are fiddled and that Gordo will be imposing massive undeclared tax increases within the next six months. And that would be difficult to dispute- it's the Socialist way. But that doesn't stop DD's tax cutting plan being viable- even if the cuts have to be off a higher base. The key thing here is that economically we need a clear rules based framework for controlling the growth of spending- politicos can't be trusted to exercise discretion. Plus, by reasserting our tax cutting credentials NOW, the contrast with the next incoming Gordo bombshell will be all the clearer- and the electoral benefits will be all the greater. Davis is using the wrong language on the wrong argument. Tory + Tax CUTS = voters swithcing off all over the country. We've been there done it and got the defeats to prove it. Saying we've got four years to persuade people with a message which has failed for the past 8 isn't compelling. Please please please let us start accepting that fairer taxation (why are we still using the negative word CUTS?) is a means to an end...better public services and wealth creation. Where's the vision David Davis?